Aereo, the Barry Diller startup that was delivering local over-the-air TV programming to online and mobile app users, has been deemed illegal by the United States Supreme Court. The Court’s majority opinion was that Aereo is similar to cable TV, and is therefore subject to the same copyright obligations. We should have seen it coming: Chief Justice John Roberts had earlier said that Aereo’s entire model was to circumvent copyright law. 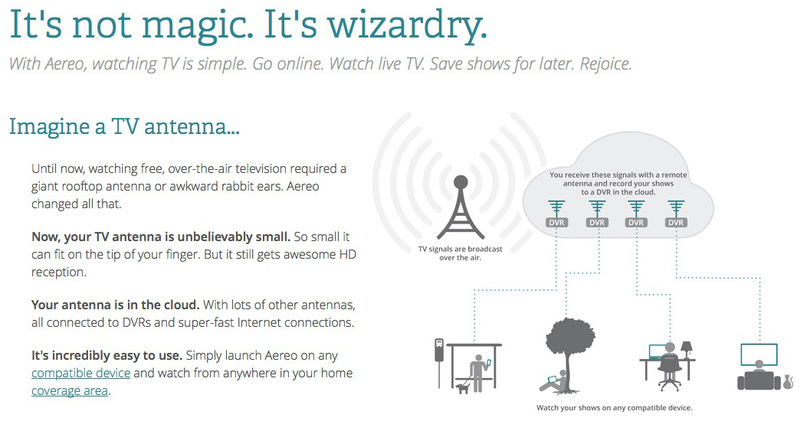 Aereo rents dedicated over-the-air TV antennas to each end user, and converts the live TV signal from each antenna to IP video for unicast (which, Aereo argued, constitutes ‘private performance’ that is not subject to copyright rules). Aereo also hosts a cloud-DVR service that stores recorded programming for later unicast access by subscribers. If Aereo had won this case, the power of content owner to charge retransmission fees would have diminished, reducing pressure on operators to raise prices to the consumer. Aereo would have continued its expansion toward national coverage. With this decision, retransmission fees are likely to increase, supplementing existing revenue streams from TV advertising. Online TV certainly isn’t going away. Earlier this month, Leightman Research Group said that almost half of U.S. households already subscribe to an online premium video service, such as Hulu, Netflix or Amazon Prime. The TV networks simply want to boost revenue by participating in the same opportunity. Adding to what they already make from advertising. Also, the range of available TV programming continues to expand on all the major streaming video device platforms. No question that the content world sees online video as a viable channel of distribution. It just has to be on its terms, and subject to copyright law (agree or not about the Aereo decision).